The Roundtable on Sustainable Palm Oil (RSPO) completed its 16th Annual Roundtable Conference on Sustainable Palm Oil (RT16) and 15th Annual General Assembly (GA15) today, with a decision to adopt certification standard aimed to universally strengthen social development, environmental protection, and economic prosperity across the sustainable palm oil value chain. The three-day conference saw some 850 representatives from the global palm oil industry in attendance, including corporate leaders in sustainability, financial institutions, policymakers, academics, and social and environmental NGOs from around the world, reviewing deforestation problems, protecting peatlands, and strengthening human and labour rights. 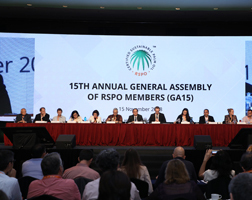 The collaborative, multi-stakeholder review process, which launched in March 2017 through to October 2018 and received almost 11,500 individual stakeholder comments was tabled, ratified and voted-in today by the General Assembly of RSPO. The review process also resulted in the subsequent development of an additional and separate standard specifically for independent smallholders, due for ratification in November 2019. RSPO CEO, Datuk Darrel Webber, welcomed the newly adopted, consensus driven P&C 2018 standard which includes a number of new elements, including adopting no deforestation through the implementation of the High Carbon Stock Approach. 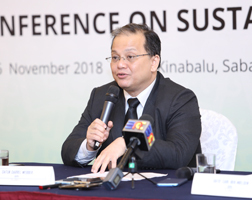 “Today, we endorsed a universal, transformative, and integrated agenda, intended to strengthen transparency and inclusivity in the RSPO system, increase implementation of the RSPO standards, boost market uptake of sustainable palm oil through shared responsibilities, and create an enabling environment for our shared vision of market transformation,” he said. 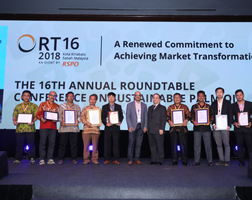 Other topics of interest at RT16 included sustainable financing and the responsible consumption and production in emerging markets. RSPO’s also released their latest Impact Report. Datuk Seri Panglima Wilfred Madius Tangau, Deputy Chief Minister and State Minister of Trade and Industry, Sabah, also had a chance to deliver a speech at the conference.Professor Kai Chan from the University of British Columbia provided the opening keynote address. The closing address was delivered by Dato’ Carl Bek-Nielsen, co-chairman of RSPO and chief executive director, United Plantations Berhad.